Introducing the 5/7 @ I-57! I've been saying there's a market for a race like this all year on the podcast: time to put my money where my mouth is! 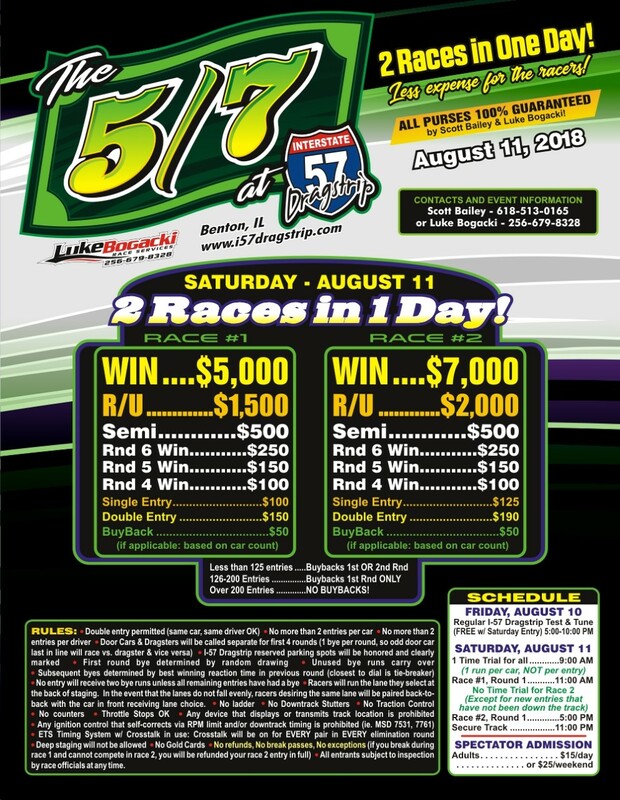 One day w/ lots of racing & guaranteed money. I think this makes a ton of sense for racers within 4-5 hours! Hope to see many of you there! 1. Two GUARANTEED purse events in One day (less travel expense)! 7. Fun Atmosphere: It’s fan appreciation night, so we’ll have a lots of spectators to watch the action! 8. Hospitality: an appreciative staff & the best concessions in the Midwest! 9. No Box racers welcome (This is an amendment to the flyer pictured): cross talk will be turned off in the lane of racers who wish (tell the tower upon entering and display the “N” on your window). No Box competitors will run with the door cars (no separate class/call). We look forward to seeing you Friday evening/Saturday morning!